There’s almost nothing that I love more than seeing my son’s reaction when my husband returns home from work. 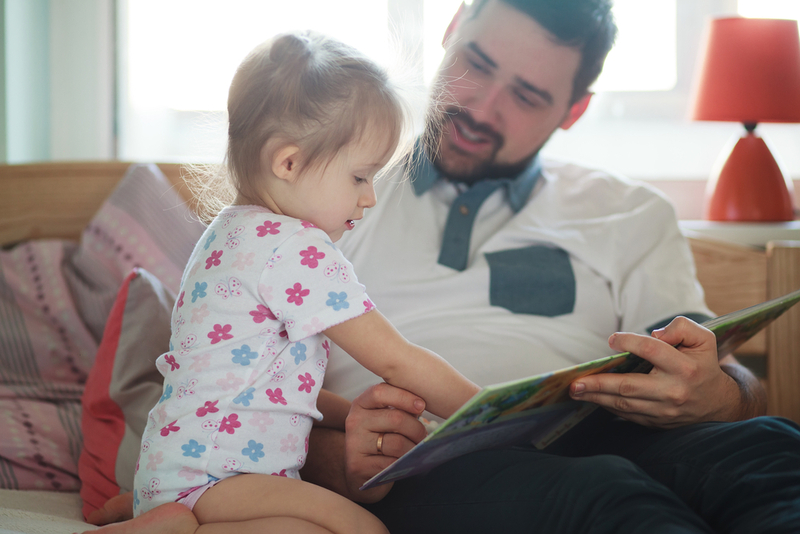 As soon as he hears my husband’s footsteps approaching the front door, he shifts in his seat and says one of his favorite words, “Dada.” Then, when they’re face to face, they meet each other with huge, identical grins followed by a big hug and kiss. Whether the ball is plastic, soft, big, or small, it doesn’t matter. Our toddler absolutely loves throwing it, chasing it, and trying to catch it. 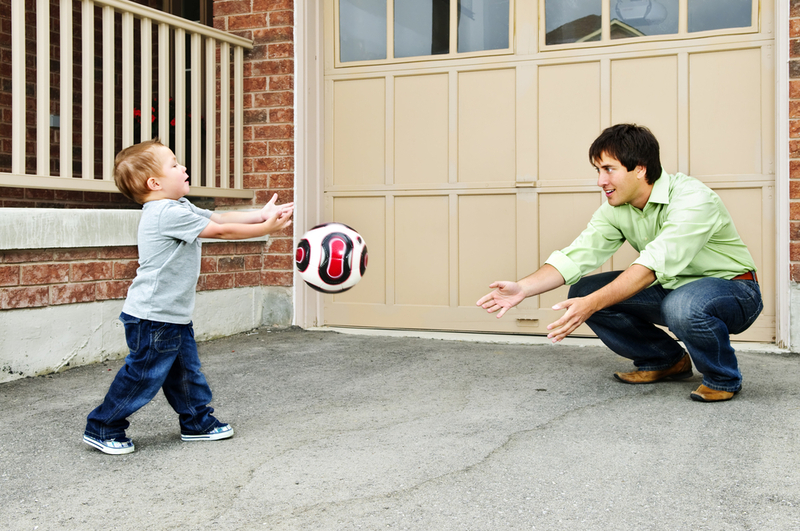 Playing catch is not only great exercise for our toddler, but it’s also a good developmental activity. It builds hand-eye coordination, and prepares our son for future catches with a mitt and baseball. We don’t know why this is, but if my husband lies flat on his back, our son stops whatever he’s doing and climbs on his dad. Best of all, our son finds this absolutely hysterical, laughing endlessly as he maneuvers from one side of my husband to the other. Luckily, I’ve captured some great photos of my son climbing on my husband, and I’m planning to create a collage with them for Father’s Day. During the week, we’re too busy to go anywhere except the local park. But on weekends, we like to plan fun activities that expose our toddler to more of the world. A few weeks ago, we visited a petting zoo, where our son fed pigs, pet sheep, and even came face-to-face with a giraffe. He was delighted, which delighted us, too! My husband and I used to live 15 minutes from the beach, and enjoyed dipping into the sea at least once a week. But now that we live in Manhattan, we rarely swim. As my son’s first year birthday approached, I realized that he hadn’t even been to a pool. It was December, so our options were slim. But we found a Russian bathhouse — complete with saunas, a jacuzzi, and an indoor Olympic-size pool! My husband held our toddler, showing him how to kick his legs and splash. At first he was scared, but with his Dad showing him the ropes, he quickly warmed to the water. My husband loves art museums, and he especially loves sharing the experience with our son. He carries our son to different art pieces and tells him why they’re special, pointing out the different colors and textures. When my son gets restless, he encourages him to walk to different exhibits — and then stops him just before he gets too close! After a busy day, curling up with a book and our toddler is as cozy as life gets. Our son sits on my husband’s lap, his soft hair beneath his chin, and my husband reads book after book, using different voices for the different characters. Our son’s favorite books are currently The Pout Pout Fish, Harold and the Purple Crayon, and a special first year photo book with captions that we created for him. What are some of your favorite toddler-friendly activities?